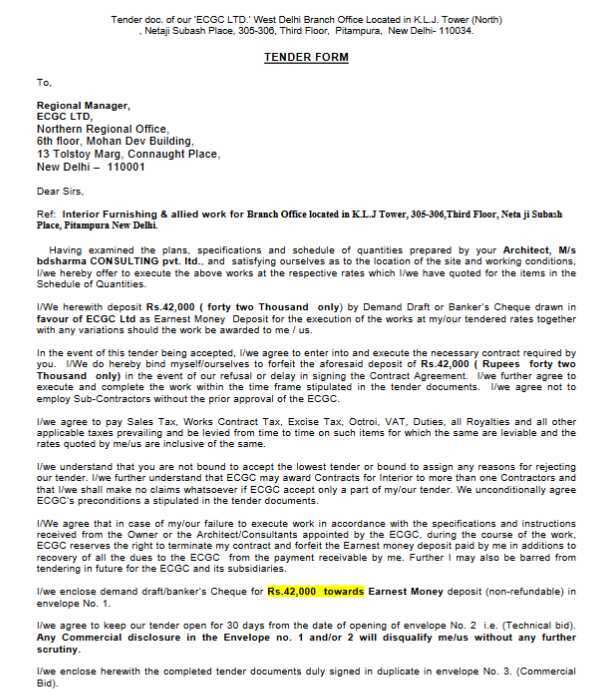 Hello sir I want to know about the tenders given by ECGC so please provide me suitable information about the same. 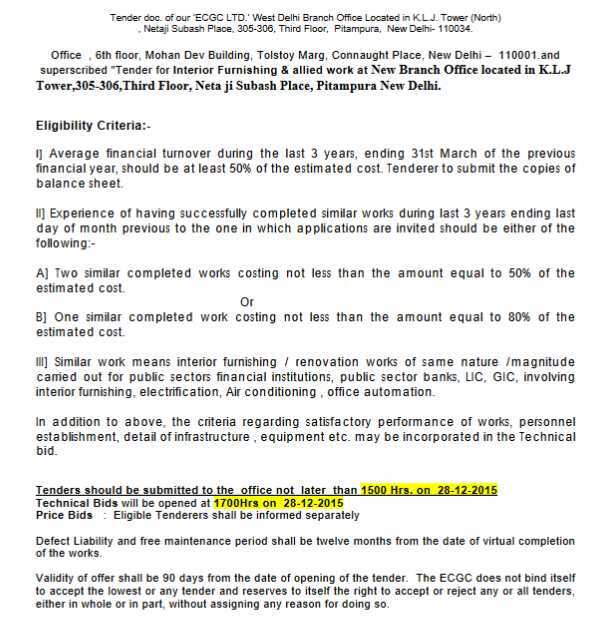 ECGC Limited (formerly known as Export Credit Guarantee Corporation of India Limited) invites tenders from well experienced contractors in two Packet systems for execution of interior work comprising of Civil/Electrical/ Carpentry for its West Delhi Branch Office. The Premises located at Unit-305-306, 3rd Floor, KLJ Towers(North), Netaji Subhash Place, New Delhi -110034. A] Two similar completed works costing not less than the amount equal to 50% of the estimated cost. B] One similar completed work costing not less than the amount equal to 80% of the estimated cost. III] Similar work means interior furnishing / renovation works of same nature /magnitude carried out for public sectors financial institutions, public sector banks, LIC, GIC, involving interior furnishing, electrification, Air conditioning , office automation. 1.1 The site is located at located in K.L.J Tower,305-306,Third Floor, Netaji Subash Place, Pitampura New Delhi. 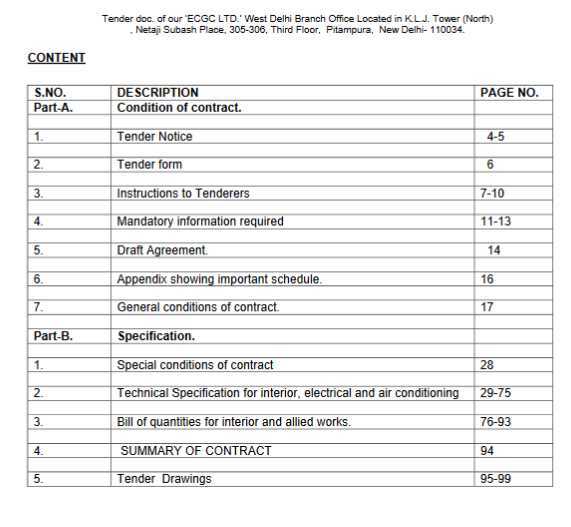 1.2 Tenderers must get acquainted with the proposed work and study drawings, designs, specifications, conditions of contract and other conditions carefully before tendering. 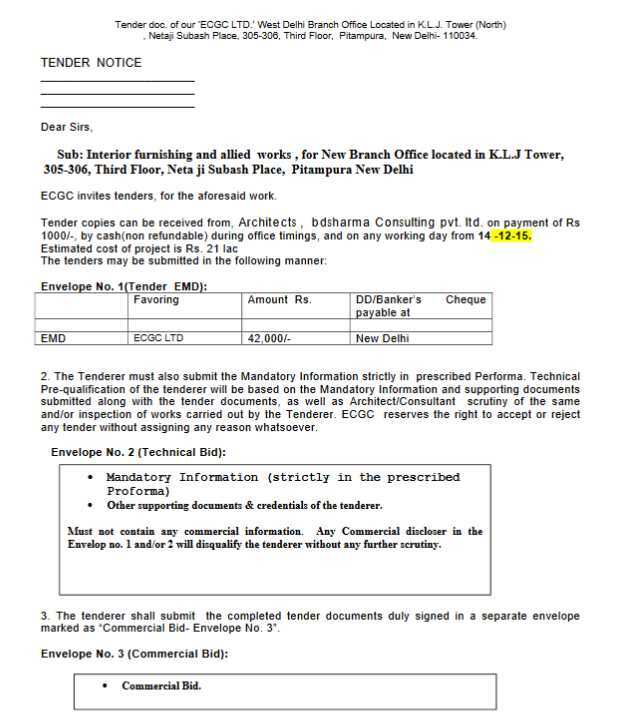 The Tenderer shall seek clarifications on any item, if required, prior to submitting his tender. No request of any change in rates or conditions for want of information on any particular point shall be entertained after receipt of the tenders. 1.3 The Tenderer is advised to inspect the site to ascertain the nature of site, access thereto, location, facilities for procurement of materials, labour rates and execution of the work.